You can strengthen your vendor relationship by accessing your vendor’s instance of Salesforce from a web portal and getting first-hand access to leads, accounts, opportunities, and other tabs to manage your deals. You can get leads assigned to you in real-time — no waiting forever after a trade show ends to see which leads to pursue. You can also provide your channel managers with real-time updates on the status of deals that you’re trying to bring in. That way, if you need some assistance, your channel manager can view all deal-related activity that occurred up to a certain point and provide you with the appropriate resources to close the deal. As a partner sales rep, you’ll receive an email from your vendor’s Salesforce administrator after he’s ready for you to start accessing the community. The email welcomes you to the community and provides you with everything you need to log in. In this email, click the appropriate link to log in directly to your community and change your temporary password. Remember to bookmark the URL for easy access later. After logging in and changing your password, you’re brought to the home page for your Partner Community. Every time you log in to the Partner Community, you begin at your home page. You’ll see that the Partner Community is organized into a series of tabs. The look of your portal may resemble your vendor’s branding or your own. 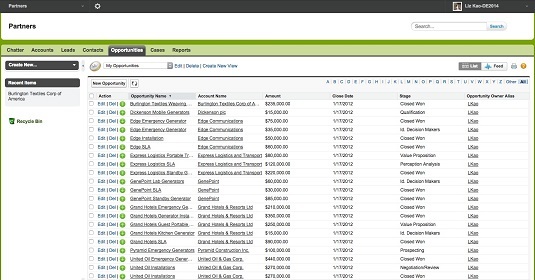 Similar to a direct sales user’s view, a partner will see a Leads tab, which contains leads that have been assigned to the partner directly or to a general queue. The queue allows channel managers to make leads available to their partners on a first-come-first-served basis while also avoiding multiple partners working on the same lead. After you claim a lead from the queue, no other partner can claim it. Play nicely. The Force.com platform is very customizable, and your vendor could set up rules for how many leads each partner can claim so that a partner with an itchy trigger finger doesn’t take away all the goodies. If you see a record in your list, that’s a lead in a queue that you should claim if you think you’re the right partner to pursue it. You’ll see that the Action column displays Accept for these types of leads. Click the Accept link for that record. A link to the lead now appears in the Recent Items section in the sidebar. You can click it to review more information about your lead and update the lead status to begin pursuing this suspect. Click Edit to update the lead. After all, you want to be able to work on all the leads that you claimed so that your channel manager sees some results. Click Save after you update the record. The Lead page reappears. Click the Opportunities tab at the top of your Partner Community. Select the My Opportunities option from the List View drop-down menu to see a list of opportunities that you own. Viewing your opportunities from a community. Click the Edit link next to the opportunity that you want to update. Update the fields to reflect the latest developments in the sales deal. When finished, click Save. You are returned to the List View page.